Alidia is as close you can get to a Goan Village experience. Alidia has 5 beautiful Goan -Portuguese Villas set very closely to each other, amidst a swimming pool and lush green garden, giving you a very cosy feel of the whole place. Its more like a tropical paradise experience. Set back behind the whitewashed church, this convivial place has beautifully kept rooms and cottages fronting onto the beach. A rare piece of quiet in the otherwise throbbing world of Baga. Alidia Beach Cottag is an extremely pleasant place to stay, set in the heart of Baga but away from its vocal cords. Tucked cosily between the friendly manager’s house and the beach. 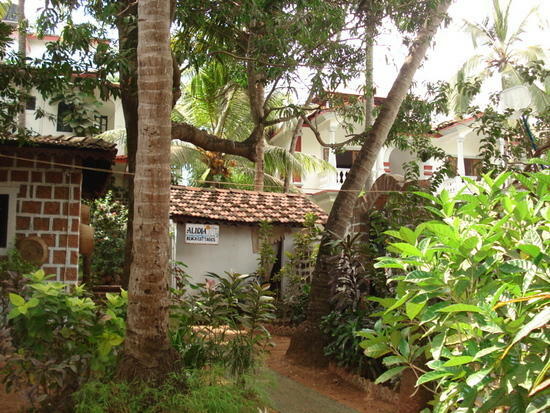 The buildings are painted crisp white but adorned with typical Goan red tiles. There are several balcony areas for enjoying a drink between the trees and the lovely stone stairs in the complex have been worn smooth with time. Windows are arched and the low-key open air restaurant is the perfect place to sit and watch TV or read a book while enjoying a drink. Alidia Beach Cottage has a total of 40 Rooms, of which they have Standard Non Air Conditioned rooms, they have Air Conditioned Deluxe rooms and some Suite rooms. The suite rooms comprise of 2 separate rooms, of which the bedroom has an LCD T.V , bed and attached bath, the Living Room has a small single bed and a coffee table with 2 chairs and a balcony. Alidia Beach Cottage presently has 15 Air Conditioned rooms. If you have not decided yet or wants to customize tour itinerary or hotels listed above in "Alidia Beach Cottage Boutique Resort Package in Goa", then we can change the travel itinerary and make a personalized, tailor-made holiday package, especially for you. We can modify this travel package as per your itinerary, budget, duration and the tourist places you would like to visit, including transportation and airfare should be included or not. Please fill the form below to contact us.